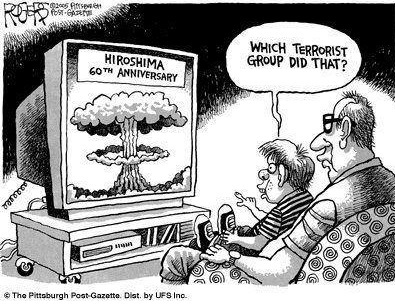 Terror: The Real Reason for Hiroshima & Nagasaki Stalin said you cannot rule without terror. 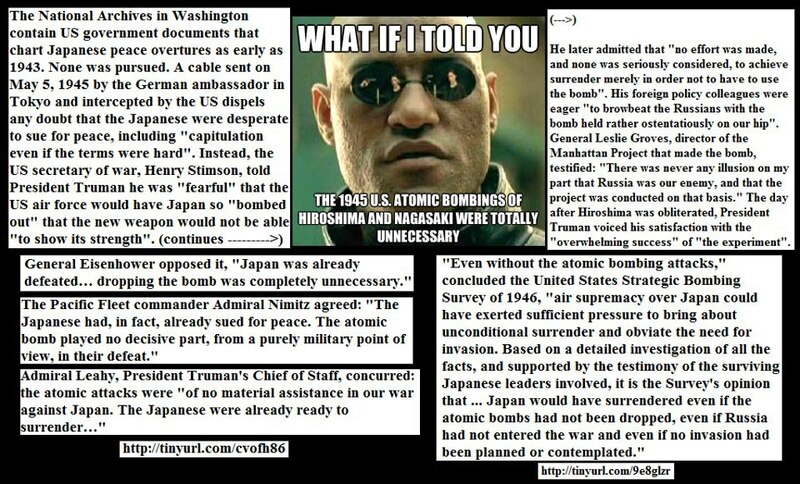 Dropping nuclear bombs on Japan set the stage for the Cold War which froze the world in fear for four decades, cost Americans alone five trillion dollars, and distracted them from the real enemy, the Illuminati central bankers. As soon as the Cold War ended, we had 9-11 & the "War on Terror." Leahy, the American admiral, concluded (op.cit. ): "By being the first to use the atomic bomb, we stooped to the moral level of the barbarians of the Middle Ages...This new and terrible weapon, which is used for an uncivilized war, is a modern barbarity unworthy of Christians." Thus all those leaders, which a genuine "International Court" made up of neutral countries would have placed with the war criminals alongside Goering and his gang, discovered an unhoped-for alibi with the "gas chambers", the "holocausts" and the "genocides", that could justify, if not eradicate, their own crimes against humanity. The Founding Myths of Israeli Politics by Roger Garaudy.